I had just crawled into bed, exhausted after a long day. My four-month-old puppy tried to get comfortable in her crate next to me. She was still getting used to her new home and was full of pent-up energy. The torrential rain we'd experienced that day didn't help and she had worn me out. A drop of water landed on my shoulder. I looked up and saw a patch of ceiling above me was soaked through. Dragging myself out of bed, I got a ladder from the garage and climbed into the attic. There's not a lot space up there. Certainly not enough to walk around. I had to crawl over duct pipes and under beams to get to the right spot. When I got there, I found water dripping from the roof and pooling in the attic right above my bed. It was a frustrating moment. The roof was just four years old and still under warranty. Two year ago, I had noticed a leak in the same place after an unusually powerful rainstorm. The roofer came out and told me he had fixed it. Apparently not. I sopped up the water and laid towels in the attic to absorb the continuous dripping. Then I crawled back into bed even more exhausted, after making a note to contact the roofer in the morning. 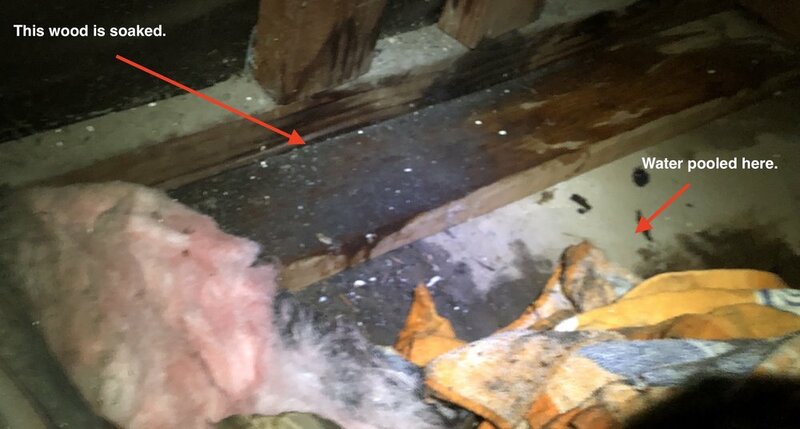 The next day, I sent an email to the roofer with pictures of the leak. The rain had stopped, so it was no longer an emergency. I figured he would have his hands full with similar requests and might take a day or so to get back to me. A new roof was leaking. The roofer told me he had fixed the roof, but it wasn’t. I was exhausted and trying to sleep when I noticed the leak again. I worried about damage to the ceiling (it turns out, there was). And now the roofer wasn't returning my message. I tried calling. A recording said the number was disconnected. I went to the website, but the website no longer existed. I did a web search of the company name and saw it had gone out of business. Damn. There goes my warranty. This leak was about to become an even bigger problem because I would have to find another roofer and pay for the repair out of pocket. Part of the ceiling would need to be replaced as well, after water soaked through it. Out of curiosity, I searched the roofer's license on the state licensing board website. Perhaps the license was still active and the roofer had moved or sold the business. Or maybe I could just track the guy down and give him a piece of my mind. The search result was not what I expected: "This license was canceled on the death of the contractor." I'm not sure what happened. He wasn't an old man. I imagined his family missed him, deprived of his presence earlier than expected. He had employees, too, and I imagine they all lost their jobs. Suddenly, my leaky roof wasn't as important. We all face frustrations as customers. Some of us lose patience and rant and rave as though it's a matter of life or death. It almost always isn't. This experience was a reminder. I've worked with a couple of clients where service really was a life or death matter. The service they provided literally contributed to saving lives. So I've seen the difference between that and a leaky roof, an undercooked steak, or a flight delay. Customer service is not life or death, unless it really is, so act accordingly. It’s important to treat others with empathy—you never know what they are experiencing. Every job is a part of your legacy, so always do good work. I'm still not happy. And I'm a bit conflicted between my empathy for the roofer's family, friends, and employees, and the knowledge that his legacy in my mind is a service failure. But I'll try to maintain perspective as the next storm rolls in. Customer service often involves empathizing with customers. It can be highly rewarding to connect with someone and help them feel better. Sometimes, you can almost see the weight leaving their shoulders or hear it in their voice over the phone. But we all have our limits. Empathizing all day, every day can be exhausting. 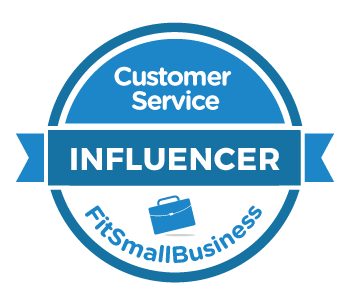 A Customer Service Tip of the Week subscriber recently contacted me because she was concerned her team was experiencing empathy fatigue. They were getting worn out and she was looking for resources to help. Here are a few suggestions if your team is in the same position. Think about situations where you or someone on your team has to empathize with angry customers all day, every day. You listen to their story and absorb their anger. You apologize, try to help them feel better, and then look for a solution. And repeat. And repeat. Yikes! None of these sound like an ideal recipe for a happy and helpful customer service representative. There is some hope for those who spend their day empathizing. One of the biggest impacts of empathy fatigue is we dehumanize the person we are serving and stop caring about their problems. A 2015 study from researchers C. Daryl Cameron, Lasana T. Harris, and B. Keith Payne discovered that we are less likely to dehumanize someone if we feel that empathizing with them will be rewarding. In other words, it becomes easier to empathize with a customer if we believe helping them will make us feel good. One leader I recently spoke with encourages employees to share success stories during a daily team huddle. It helps people work through challenging times and stay focused on remembering all the people they help each day. Other leaders engage their team in iceberg hunting. This involves investigating unusual issues and looking for practical solutions. Employees feel empowered and a sense of pride when they can solve an iceberg. Some clients I've worked with have become experts at customer storytelling. For example, a medical device manufacturer has large posters covering the walls of its office with pictures of patients whose lives have been saved by the company's products. These stories are often shared in meetings and company updates, to remind employees they are helping to save the lives of real people. It seems like there's always something wearing us out. Empathy fatigue is just one of several types of fatigue that can hurt customer service. Find ways to make empathy feel rewarding (see above). Encourage employees to take breaks and recharge. Create a customer service vision to give the team purpose. To discover more hidden, counterintuitive, and unusual obstacles that stand in the way of great customer service, check out my new book, Getting Service Right. Many customer service employees view the holidays with dread. It is supposed to be a joyous, festive time. The reality for many of us is our already busy days are filled with holiday activities such as baking, writing holiday cards, getting our Christmas shopping done, and attending a multitude of holiday parties. Some customer service employees experience all that coupled with their absolute busiest time of year. They log countless hours of overtime. Each workday is a never-ending line of customers. There are three types of fatigue in particular that are dangerous this time of year. 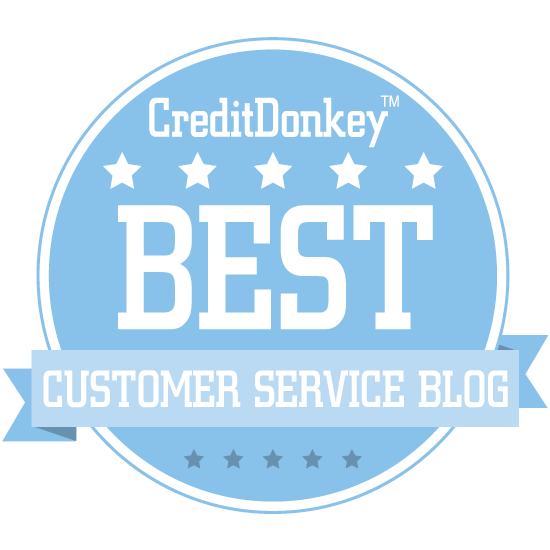 Here is an overview of each one and how it may harm your customer service. Health care professionals generally recommend adults get seven to nine hours of sleep per night. A 2013 Gallup poll found that 40 percent of us get less than that. The Centers for Disease Control and Prevention lists concentration and memory as the two highest-reported effects of insufficient sleep. We see this in customer service when employees have difficulty concentrating on your needs or remembering to call you back as promised. Many of us overdose on coffee to compensate for a lack of sleep. Studies show too much caffeine can lead to difficulty sleeping, which makes the problem even worse. How much employees sleep is largely outside of our control, though there are a few things we can do. Share this blog post with employees and discuss it. Try to keep employee schedules as predictable as possible. Customer service employees are besieged by distractions. We're asked to multitask. The average contact center agent juggles five to seven computer programs using two monitors. Our daily world is filled with buzzes, beeps, screen flashes, and other signals that constantly capture and redirect our attention. Over time, those distractions cause fatigue in the parts of of our brain that focus attention and block out external stimuli. This is known as Directed Attention Fatigue, or DAF. Some psychiatrists refer to it as Attention Deficit Trait (ADT) and suggest the symptoms are very similar to ADD. All of these can be detrimental to outstanding customer service. This makes it essential for customer service leaders to help employees avoid or recover from DAF. Promote a workplace free of unnecessary distractions. Reconsider whether using two computer monitors is a good solution. Encourage employees to take breaks outside, since nature is known for its restorative qualities. Set up a quiet room at work to give employees a place to unwind. Customer service employees are supposed to care about customers. We're expected to listen intently, try to understand customers' feelings and emotions, and take action to show we really understand. This is another list that clearly isn't conducive to outstanding service. Customer Focus. Burnout risk goes down when employees believe their company is customer-focused. Empowerment. Employees are less likely to face burnout when they feel empowered to help their customers. Quality. 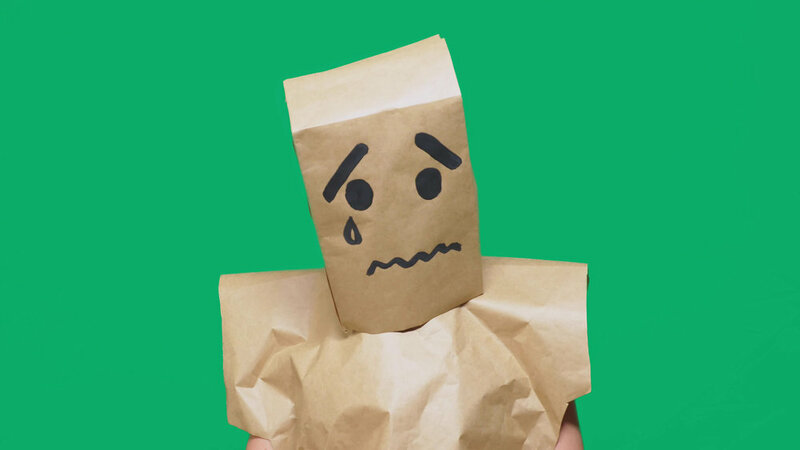 Better products and services mean fewer upset customers, which means less empathy is needed. Elite companies are relentless about avoiding angry customers in the first place. In his article, The Dopamine Economy, Umair Haque explains how many of our habits are unhealthy for our mental well-being. A lack of sleep, constant distractions, and an inability to truly focus result. These habits become ingrained because they trigger dopamine releases in our brain. This makes these unhealthy habits incredibly addictive. One way to break the cycle and recover is to schedule an unplug event. You can try this on your next two-day weekend. Avoid all digital media. That means your smart phone, your computer, and even the television. Spend time outdoors. Try going for a walk or a hike where you can get some fresh air and observe natural beauty. Engage with friends. Have a game night, invite some friends over for dinner, or do something else that allows you to spend quality time with other people. The first day won't be easy, but it gets better. By the end of the weekend, you'll likely feel more refreshed and focused than you have in a long time. A subscriber recently sent me the transcript from a chat session she had with a customer. Her customer had gotten angry and ended the session abruptly. He then complained in a survey about the service he had received. The subscriber asked me, "What did I do wrong?" The gist of the chat session is the customer wrote his payment wasn't going through. The customer service representative responded by saying that, based on the error message the customer received, the most likely causes were an incorrect debit card number, insufficient funds, or a bank error. I have no reason to doubt these responses were technically correct. It was the delivery that likely angered the customer. In my reply to this subscriber, I commended her for reaching out to me. Not enough people make an effort to continuously improve. Then I suggested she try the No Fault Technique. It's helpful to start by understanding why the customer got angry and then explore how the No Fault Technique can help in the future. Let's take a moment to understand why my subscriber's original, fact-based response likely didn't go over so well. It might help to imagine yourself as her customer. Picture a website with an online payment screen. You enter your payment information, but receive an error message. Most of us would feel a little anxious and frustrated. This experience engages part of our brain responsible for emotions, called the Limbic System. It's one of the three parts of the Triune Brain, with the other two being the primitive brain, which controls basic functions such as breathing, and the neocortex, which handles rational thinking. The danger is the Limbic System can limit our rational thinking when it gets riled up. Now, imagine contacting customer support via chat and the support rep tells you the problem is on your end. You either typed in the wrong debit card, you don't have enough money, or your bank made a mistake. Now, how would you feel? It's very likely our fired up limbic system gets defensive and really shuts down logical thinking. It doesn't matter that the support rep's response was entirely rational and accurate. From the customer's perspective, it feels like blame. Blame can really send a customer over the edge. It's a good idea to side-step a fiery limbic system by avoiding blame as much as possible. The No Fault Technique is a way to do this by steering the conversation away from blame to focus on solutions instead. Lisa Dezoete, an Accounting Administrator at Truckstop.com, often has to contact customers to collect payments for unpaid accounts. Here's how she uses the No Fault Technique. "I start all calls off with a cheery voice, emphasizing it was 'probably an error' so they don’t feel embarrassed their payment did not go through." Dezoete then tries to work with her customers to find a solution, such as giving an extension when needed or canceling an unwanted account. Her goal is to disarm the customer's emotional defenses by avoiding blame. One way to practice this technique is to use it in small situations where the stakes are low. For example, if someone sends an email but forgets the attachment, you could write, "The attachment didn't come through. Will you please resend?" CSR: Let's try a few things to see if we can solve this! Try re-entering your debit card number, expiration date, and security code. Make sure the billing address is also correct. Double-check the account linked to your debit card to make sure there are sufficient funds. Customer: My card information is correct and I have enough money in my account. CSR: Ok, here's another possibility. Some banks set up special fraud protection rules that prevent certain online purchases. If this happens, a quick phone call to your bank will allow the charge to go through. If that still doesn't work, it may be easiest to try another debit card. We also accept credit cards and PayPal. Notice the root causes are still the same. The customer entered information incorrectly, lacked sufficient funds in his account, or his bank prevented the charge for some other reason. The difference here is they've been reframed as suggested action steps, which shifts the focus away from blame. The No Fault Technique won't work in every situation and customers may still get upset. But it will give you a better chance at finding a resolution! The airline passenger was angry about missing her flight. It was her fault. She had been sitting at the bar a short distance from the gate and lost track of time. Those things happen in Las Vegas. Our emotions often rise up to protect our ego, so she looked for someone to blame. The first gate agent she talked to explained the airline's boarding policies and maintained that he had made several boarding announcements. It was a perfectly rational and reasonable explanation, but it wasn't the validation she wanted. So the passenger exploded—ranting, raving, and cursing. Another gate agent calmly took her aside. He listened patiently as she told her story. He didn't try to argue with her or make her feel stupid. The gate agent used the partner technique to shift his body language so it was non-adversarial. He listened. Then he simply said, "I can understand why you're angry. You shouldn't have to feel this way." The passenger quickly calmed down and thanked him. She accepted an offer to get re-booked on a later flight. The gate agent accomplished this minor service miracle through empathy. Empathy is a core skill in customer service. Customers often experience negative emotions. When that happens, the rational part of our brain cedes control and can't function properly. Everything stops until those emotions cool down. When you empathize with a customer, it makes the customer feel better. Notice the airline gate agent wasn't agreeing with the passenger. He didn't say, "You're right, we should have sent someone to find you in the bar." What he did communicate was "I understand how you feel, and it's okay to have those feelings." He then took steps to help her feel better. Of course, this is what makes empathy so difficult. How do you empathize with someone you can't relate to? Unless you've missed a flight because you've lost track of time in a bar at the Las Vegas airport, it feels like a stretch to put yourself in this woman's shoes. Fortunately, there is a technique you can use. Here's a technique I've taught customer service professionals for many years. Step 1: Consider why the customer is truly angry. For the airline passenger, there were three issues. She was stressed about missing her flight and being inconvenienced by a delay. She was embarrassed that she caused the issue. And she was upset about the lack of empathy from the first gate agent. Step 2: Think about a time you felt the same way. Try to imagine a situation where you were angry or embarrassed about something that was your fault. We've all done something stupid. It may not have been missing a flight, but it was something. Step 3: Use that experience to identify with your customer's feelings. When we feel angry and embarrassed, the last thing we want is to hear is its our fault. (That's the mistake the first gate agent made.) We want someone to tell us they hear us, that we're not so dumb after all, and that they would be happy to help us fix it. This isn't an easy technique. I've seen many seasoned customer service professionals struggle with it. But think of the accomplishment if you can master it! That airline gate agent used empathy to de-escalate what was quickly becoming a scene. He didn't just make himself look good, he represented his airline well. Some opportunistic by-stander swooped in and told her he saw the whole thing. He too empathized with her situation and then offered to buy her a drink at the bar.